If you hire forklift drivers and you’re wondering the forklift license cost, and whether or not it’s worth it, you’ve come to the right place. ForkliftCertification.com offer the number one recognized online forklift training program, and we know, as past forklift operators ourselves, just what a license provides and what it’s worth. Simply put, a forklift license cost is much less than you’ll pay for OSHA safety violations. How much does forklift training cost? Compared to the cost of non-compliance, next to nothing! ForkliftCertificaiton.com specializes in fast, affordable OSHA compliance. Sign up with us today, and get your employees OSHA compliant! Let’s talk about forklift license training costs. Do you own a construction company, or a company that regularly uses forklifts in day-to-day operations? If you do, you probably know that the OSHA crackdowns aren’t going to stop. OSHA inspectors are just doing their jobs – but the cost of these inspections could literally put a business under, particularly when it comes to fining companies for having uncertified forklift operators on hand. 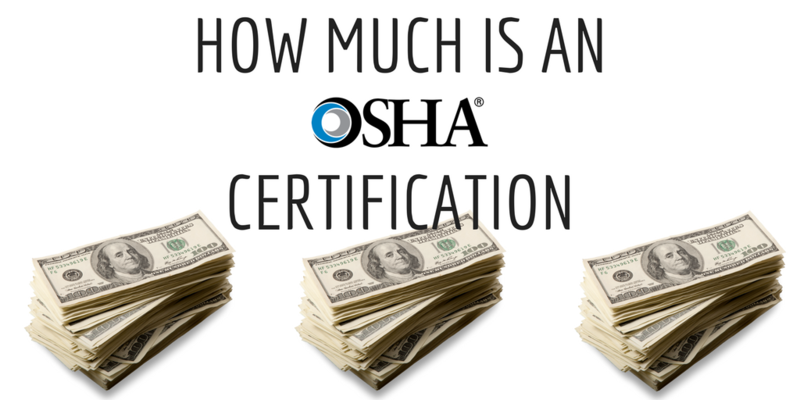 If you’ve been wondering, “how much is it for a forklift license for my employees?” the forklift certification cost for each employee is a fraction of the cost of a fine from OSHA. Let’s face it – you have to get those employees trained. Expert forklift certification courses are available, so there’s no reason to get your forklift operators out there on machines they don’t know how to use. This could literally cost one of your men his life, and it’s just not worth it – particularly when OSHA forklift certification training is easy to come by. Spending the money on a forklift certification cost is one of the best things you can do for yourself and your career. And we’re not just saying that because we sell training courses. We know firsthand the importance of training before jumping behind the wheel of a powered industrial truck. Unfortunately, forklift accidents like tip-overs happen every year, and the number one cause is operator error. Don’t worry about forklift license training costs – compared to OSHA fines and penalties for non-compliance (or, worse yet, accidents & injuries), a forklift license cost is very minimal! Your forklift license cost is secondary compared to what could happen without proper OSHA compliant credentials. Hefty fines, legal action, loss of your job – without forklift training from FLC, your entire career (not to mention the safety of your co-workers) is at risk. Sign up with FLC today, and don’t worry about the forklift certification cost. Our training modules are affordable and easy to take anywhere! If you’ve been asking yourself, “how much is it for a forklift license, and how much will it provide me regarding value?” the answer is simple: your life. These accidents lead to serious injuries and fatalities each year, and forklift training is the best way you can protect your life and prevent accidents. • Our program is entirely online, and so it will save you loads of money and time by not having to travel to a training facility. • Complete the course in only about one hour, from anywhere with an internet connection. Get the information you need, delivered right to your computer or mobile device. • Once your forklift training cost is complete – and the forklift training cost is much less than other safety training providers – simply print our your credentials and you’re good to go! • With our special forklift license training cost, you can get the OSHA compliant training you need at a great price. Our standard forklift training kit for $299 includes 7 specialized curriculums, step-by-step guides, printable templates, a trainer orientation DVD, and a safety first course. At only $59.95 per module, you won’t be weighing the forklift license cost and value in your head. And with free renewals, our online forklift training program is a no brainer. Our train a trainer kit for $149 is designed to train a qualified forklift operator to become a designated forklift trainer. By training an employee to be a trainer, you can save on expenses in the long run by having someone onsite to do proper training. The forklift certification cost per employee becomes very low when you can train them yourself. Our bundle package for $399 includes everything in the training kit and train a trainer kit with a $50 savings! OSHA COMPLIANT TRAINING AND REDUCED FORKLIFT TRAINING COST – CALL FLC TODAY! Don’t let forklift training costs keep your company from becoming OSHA compliant. If your forklift operators haven’t received OSHA safety certifications, it’s time to get started today! The cost of the training will be far less than the potential financial, physical or emotional cost of neglecting to keep your employees safe. There’s just no substitution for safety – and when proper forklift certification in a classroom or digital setting means the difference between life and death for your employees, you can’t skip it. The resulting fines could also mean life or death for your business – and it’s just not worth the gamble. With ForkliftCertification.com, forklift license training costs aren’t a big deal. We’ll get your employees trained to the latest OSHA safety standards in no time at all – at affordable rates! Choose a training package in order to get started. For any questions about our OSHA forklift training courses, or if you need more information on your forklift license cost, call FLC today at (888) 278-8896. Thanks for considering ForkliftCertificadtion.com for your forklift training. We make sure forklift license training costs don’t come between your company and optimal safety!